"As a group we examined the mountain and pointed out the lines which were most likely to trigger off an avalanche. It was a wake-up call FOR US because those were the exact lines that we would have once taken. we wouldn't have given it a second thought". That was one year ago during the AIARE (American Institute for Avalanche Research and Education) Level 1 Backcountry Course that we took at Apex Mountain School in Colorado. It has saddened me to hear of the news of so many deaths and close calls from avalanches this season. I realise that each year there are incidents but it doesn't make hearing the news any easier. These unfortunate incidents have resulted in the deaths of some very experienced snowboarders and skiers and are a reminder of how powerful and ruthless nature can be no matter how skilled you are. Taking that 3 day backcountry course last year was a real eye opener and we're so glad we did it. Skiing and snowboarding in the backcountry takes an entirely different approach to riding at a ski resort. We knew this in theory, but getting out there and putting what we learnt into practice really put things into perspective for us. I wanted to share with you some of the things that we learnt so that you can understand the type of things you need to know and just how easy it is to trigger off an avalanche. In just about every snowboard or ski movie, there is a scene where an avalanche gets triggered off. It's usually on mountains so steep that you might wonder how snow even stays on there at all. The thing is, you don't need a lot of pitch for an avalanche to take place. In fact, any terrain which is greater than 25 degrees in steepness is considered potential avalanche terrain. Think about it. Estimate what that looks like right now. It's pretty much a blue run. Just because you rode somewhere yesterday, doesn't mean it's safe to ride there today. The snow is made of many different layers and these are affected by so many factors including historical data, the wind, overnight temperatures, sun exposure, direction and new snow. Major kudos to ski patrol at resorts all over the world. It is a massive job to make sure the mountain is safe for you to ski on. 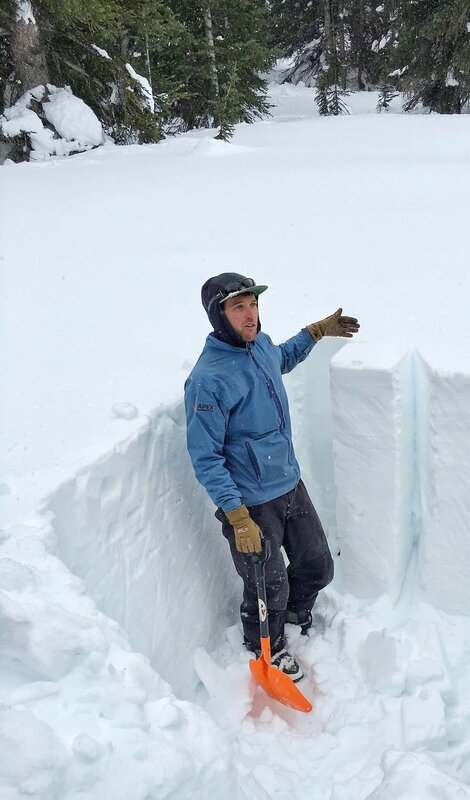 In our course, we dug deep pits in the backcountry and then examined the snowpack. It was truly amazing to see the different layers of snow. How this snow is layered, the type of snow each layer represents and the stability of each layer will affect the avalanche risk. We then cut out a block and tested what sort of impact it would take to trigger off an avalanche. It didn't take much. Here's a video of me helping to dig a pit and then working on the walls so that the layers don't get disturbed. I'm guilty. One time we wanted to ride in an area where it is mandatory to have avalanche gear, as a minimum - a beacon, probe and shovel. It was our first time going into that sort of terrain so we hired some from the local shop and sort of ran through it all in our living room the night before. We had an epic time the next day, and thank the snow gods that we didn't have any incidents, but I am pretty certain that if one of us had gotten buried in an avalanche, there would have been little chance of survival. It's easy to know something in theory but when a real crisis occurs, it's a whole different story. During our backcountry course, we headed out to some deep snow in pairs where one of us buried our beacon and the other one had to find it. Despite knowing that it wasn't an actual person buried under that snow, it was still stressful. Based on historical data, the survival rate for a person buried in an avalanche decreases dramatically after 15 minutes. It's not a lot of time. Even if you do know how to use your gear, does the rest of your crew? After doing practice drills, I realised how important it was to make sure that the entire crew that you're heading out with knows how to use their gear. If things head south, you are going to have to rely on them to save your life and vice versa. It's really important to practice and do drills until you are comfortable with using your equipment. A lot of ski resorts have beacon training parks but you can really practice anywhere there is snow. You are only as strong as your weakest link. Before you head off to the mountain, a full risk assessment should be conducted and based on that, the decision should be made whether it is safe to head out into the backcountry at all. A plan should then be formulated with your entire group which includes various scenarios. This part is really important because when you get up to the mountain and powder fever sets in, emotion can take over and it is at these times where it is most important to stick to the plan. FIELD BOOK TO STORE PLANS AND DATA. ALSO A FRUIT & NUT BAR - ALWAYS HANDY TO HAVE. I mentioned earlier that you can't ski or snowboard in the same way that you would at a maintained and patrolled ski resort. In the backcountry, you have to assess and take different lines. You have to have safe zones with your buddies and not ride on top of each other. And you definitely can't hit a feature like you would in a terrain park. Most of all you have to maintain good communication with each other, determine safe meet up spots and check in regularly to make sure everyone is ok. It was comprehensive and it was an intense 3 days - there was a LOT of information to absorb. Do I feel ready to head out into the backcountry without a guide? The answer is no. I would want to spend a lot more time putting that theory into practice - digging more pits, testing my risk assessment skills and doing more emergency drills. But I do feel better equipped with a greater understanding of what to look out for and what to do in sketchy conditions. Do you have any thoughts or experiences to share on this? Let me know in the comments below! Like it? Save to Pinterest!